The top three winners (from left) Farisya Izzati, Hamden Harbi and Mohd Deen after their eight-game final. KUCHING: Hamden Harbi outbowled seven other finalists to win the 129 & Below category of the Megalanes Skin’s Challenge Final at Megalanes Adventure World, King’s Centre on Tuesday night. He posted a total of 1,169 pins in the eight-game final, finishing just eight pins ahead of Mohd Deen. 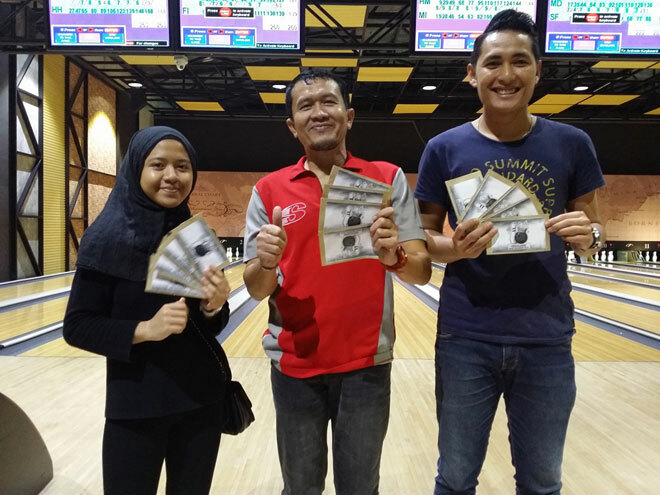 In third place was Farisya Izzati with her total of 1,124 pins while Farhan Hakim grabbed fourth place after knocking down 1,047 pins. Mohd Ikhwan ended his campaign in fifth place with 1,032 pins, followed by Desmond Law in sixth place with 1,015 pins. Hasbe Mohamed (958 pins) and Siti Fazilah (924 pins) completed their final in seventh and eighth positions respectively. The 129 & Below category has just been introduced to the Megalanes Skin’s Challenge, replacing the previous 109 & Below category.